Where would you rather live - in a lonely flat with your drunk father, only bearable when your big brother is home? Or in a small, snowy village with a frozen lake, where your aunt burns books to keep the house warm, and a girl called Pi makes your heart beat a bit too fast, and your cranky old neighbor teaches you to catch fish that look like ice dragons, and a hawk owl watches out for you by night? Mik has been skating on thin ice his entire life. When he is forced to leave his new home with his aunt Lena, he leaves behind icy northern Sweden and all his new friends, and his life becomes a living nightmare. Through forests and along train lines, over rapids and waterfalls, Mik is determined that nothing will stop him from finding home at last. 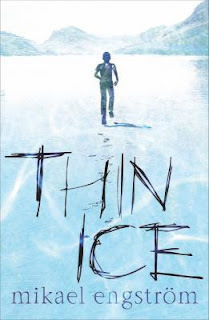 Thin Ice is about a boy with a terrible home life and his quest in finding a real home. This book was simply not for me. There were certain aspects of it that I liked but as a whole, but I couldn't connect with it on any level. The characters in the book seemed really flat and quite odd, especially the ones in the small town Mik's Aunt Lena lives. You'd think that them being a bunch of odd townsfolk would give them a bit of depth. However they all seemed just that: odd. It's almost as if they were odd because they were townies and townies are supposed to be odd. They were fun to read about because they definitely made the story livelier by just how weird they all are (there's this girl who sucked on Mik's earlobe when they met. How weird and inappropriate is that?) but I just didn't care about them at all. Their weirdness was entertaining but not endearing. Mik was well developed, I got to give him that. He went through a lot of pains living with a perpetually drunk father then eventually being passed around by social services. However there were more moments where I felt like he was being a big brat. I guess I can't blame him though - he's just a kid, clueless to everything that's happening around him, forced to deal with a really difficult situation. I did like reading about his gradual (bordering on too slow) transformation. I do have to say though that what the story lacked in character development made up for with adventures. Considering the protagonist in the book is a boy with kids around the same age as him, I'd say their adventures were well written and highly imaginative. Sadly though, that wasn't enough for me to like the book entirely. The way the story ended wasn't really appealing. It was almost like everything happened because that's what happy endings are about but it wasn't written in a better way. Speaking of writing, I had trouble getting into the story because of how the chapters were cut and sentences were formed. It was almost like most of the time, the writing felt....distant. Detached. Emotionless. (Awkward.) I could only feel Mik's emotions whenever he wrote to his brother Tony about the weird things he witnessed, or how he felt when he went to a new school, or what he did whenever he was scared. But I didn't get as much insight from him as I'd hoped. 6th graders are allowed to have some insight, right? Maybe this could be due to the fact that this is an English translation. Perhaps things got "lost in translation." I don't know. The writing was a bit off. I can see how this book could work for some readers, especially those who's read enough books in this category but for me... not so much. At most, I thought it was okay. its a shame when books get lost in translation. one book that i read that they seemed to get right was the ruby red. it was very good.